This 'Rona and the Moon' Legend was rewritten by Luke and Dorian. Here is another one of our 'Rona and the Moon' Legends. This legend was rewritten by Rylan and Mahlee. For the past two weeks we have been learning to use our five times tables to help us answer more challenging times tables like our 6, 7, 8 and 9 times tables. Last week we did a warm up using our 2s, 5s, and 10 times tables. This week we did a similar activity. Some people were quite impressed with their improvements and asked that we take a photo of their work and post their improvements on their blogs. You can go to their individual blogs to see their work. - Many students were impressed that they were able to complete more questions in the given time. - Some students saw that they could complete all of the questions in a faster time. - There were some who saw that they got a lot more questions correct in their given time. Well done to every student in our class. You have all been working extremely hard to answer more challenging mathematical equations. Rylan was the receiver of our Principal's Award this week for his work with a junior member of the school, as well as helping many others while using Pic Collage. Below are our PRIDE Certificate winners for Week 3. Today we have finished another one of our 'Rona and the Moon' Legends. Here is Lexus and Milly's Legend. Here is another one of our 'Rona and the Moon' Legends. This legend is from Zoe and Jaunte. Here is the first of our Rona and the Moon Legends. Our class read lots of different versions of the Maori Legend 'Rona and the Moon'. We took what we had read and rewrote our own versions of the legend. Our next step was to create a poster relating to each of the stages of the legend. We scanned and saved our pictures onto Google Docs and shared them with each other. We used Explain Everything to put our legends and our pictures together. We then published each of our legends to YouTube. Look out for the rest of the Legends which will be posted over the next week. We are learning to work out our times six, seven and eight tables from our times five tables. Check out our video to see our progress. Cayden received the Principal's Award for Week Two. Congratulations Cayden. Our PRIDE Certificate winners for Week 2. On Friday Room 12 and 15 went to Tawhiti Museum. When we got back we had a debrief and talked about what we liked most about our trip. Here is a video about what we thought. 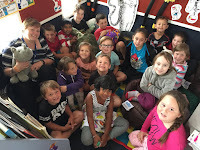 Room 12 and 15 are going on their trip to Tawhiti Museum in Hawera tomorrow Friday 16th May. We want to be on the road as soon as possible so could those parents who are joining us please meet in the learning centre at 9am. We will be taking roll and giving everyone a run down of what will be happening for the day. We have had lots of parents joining us to supervise our students. Due to limited bus space we are asking that parents car pool from the school to the museum to free up bus space for the children. - No eating/drinking in museum and other attractions. On Friday we went to soccer training with Mick Curry a Soccer Coach. We did some training like "Dish & Dome", and 'Kill the Shadow'. We then got to have a quick game of Soccer. We can't wait until they come next time. Karolin was the receiver of the Principal's Award for the first week back of Term 2. Here are our PRIDE Certificate winners for Week 1. Congratulations to those students who completed their homework each week during Term 2. These students received prizes for their awesome effort. Well done to Rylan, Joe, Luke, Isla, Hayley, Savannah, Ria, Kaydee and Dorian. Thanks to Mr Lodge and Room 14 for letting us share the video. This afternoon Room 15 were invited to Room 14 to learn some of the string games that were taught on Monday. Students from the class had seen how much fun people were having and were trying hard to teach themselves how do make some of the string figures. After a day of persevering ourselves Mr Lodge and his class worked with us to show us the steps of creating some of the different string figures.